Library Loader is a small application that takes less than a minute to install. 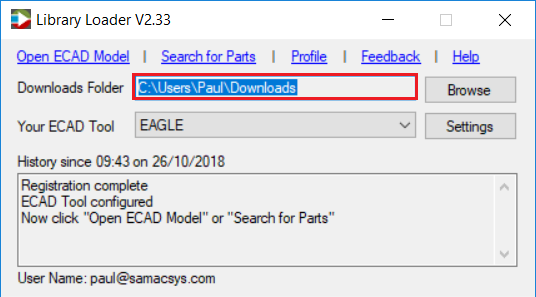 Once installed, Library Loader sits in your system tray, and just works its magic when needed to convert downloaded ECAD Models (Schematic Symbols, PCB Footprints and 3D Models) from supported websites to attach them on your cursor for placement in your ECAD Tool. 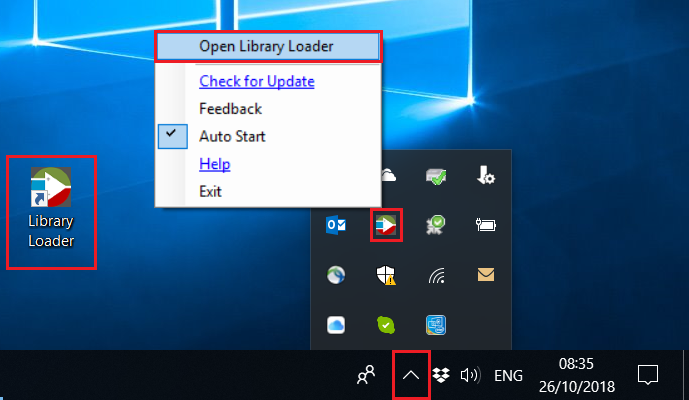 1 – Launch Library Loader: This can be done from the desktop shortcut or if already running by clicking “Open Library Loader” from the right mouse button menu on the system tray icon. 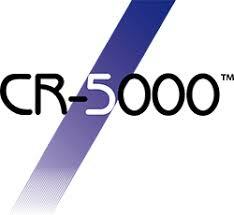 2 – If this is your first time using Library Loader, you will need to Register or Login. 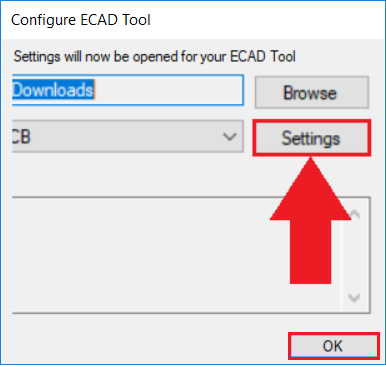 3 – Library Loader will open the Settings for “Your ECAD Tool” on clicking OK.
Click on Your ECAD Tool below to find out more about configuring these Settings. 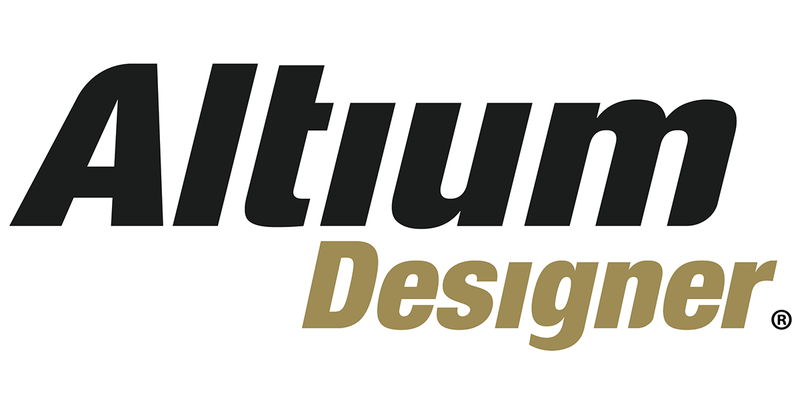 4 – Once Your ECAD Tool has been configured, you are now ready to load your first ECAD Model. 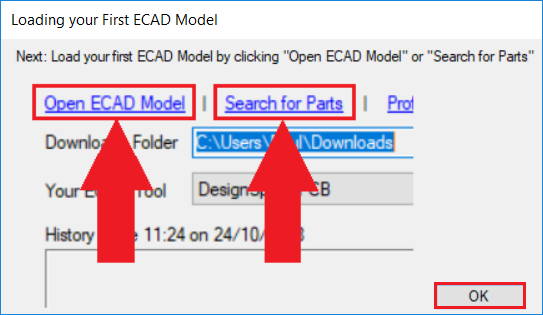 This can be done by opening a previously downloaded ECAD Model (“Open ECAD Model”) or by clicking “Search for Parts” to find your first model from a supported website. 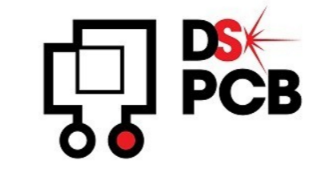 IMPORTANT – Check that the “Downloads Folder” is set to the directory in which files are downloaded from your web browser. 5 – On downloading an ECAD Model, Library Loader will now process the file and make them (Schematic Symbols, PCB Footprints and 3D Models) available for your ECAD tool.